Episode 10 of Upanishad Ganga explores the tale of Chanakya and Chandragupta in summarised way. The tale of Chanakya and Chandragupta is not only fascinating but also inspirational as well. It slams on the beliefs like “a single man’s will cannot change the society” or “you have to change yourself according to the system”. The determination and hard work, being focused on goal and take right actions, think for the good of the society in totality and vision to do it; made them immortal. Chanakya was the man who made teachers to proud on him being one. Teaching is the job otherwise not considered with much attention in modern world in most cases. But Chanakya gave the slogan “Teacher is never layman, creation and destruction play in his laps”. With the vision to make the society better, make the rulers accountable to the public, Chanakya have almost reformed the entire set of kingdoms in India and brought them under the hood of a single emperor. Chanakya was the man of strategic planning, tremendous will power, honest, focused, determined, visionary and full of knowledge. And he got one of the best students a teacher can have in Chandragupta. Born in a very poor family of lower cast, Chandragupta was a brave and skilled warrior, who followed the guidance of Chanakya and they together made the dream of better society true. Dr. Chandraprakash Dwivedi, the man behind the Chanakya serial, is also the man behind Upanishad Ganga. He have already researched a lot about Chanakya and Chandragupta in his earlier acclaimed venture. So, the material was almost ready with him when started filming this episode, so the task would be easy for him right?! On the contrary, he have explored the tale of Chanakya and Chandragupta on a very bigger scale, so exploring it in a very summarized way was a challenging job. Also, here he needed to represent the tale in the context of this TV Serial. It is tough to show the same thing in different context, different length and to almost different audience. But we say the entire team he got, did a remarkable job here. Those who are not familiar with the real philosophy of the Hindu way of living, may often mistakenly consider that it is all about spiritual stuff and heavenly happiness. The entire life is actually orgazined in a fantastic manner in Hindu way of living. Dharm (aka Dharma, not in just the religion context), Arth (Artha – the wealth), Kam (Kama – the pleasure – in broad meaning including but not limited to sexual context), and Moksh (Moksha – the final peace). We have seen the story of King Harishchandra in the previous episode of Upanishad Ganga, showing the importance of Dharma and how he have followed it. So now there is the time to explore the second goal of life, Arth (aka Artha) through the tale of Chanakya and Chandragupta. Actually Chanakya was born after the time of Upanishadas, but he is the creator of ArthShastra – one of the best books written in the field of – Economics. 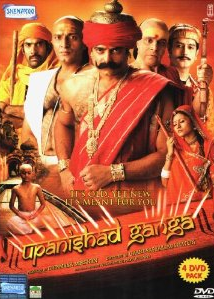 It all starts with the announcement of new rules and ruler are taking over the kingdom of Magadh (Magadha). Until then Magadha was under ruling of Nand-clan’s last king, Dhananand; now Chandragupta is the new ruler of it. We see that one of the influential businessman’s goods were seized by the authority due to discrepancy found not only in the descriptions of goods, but duties were also not paid properly. Even some fake seals were also found on the packages. Sudat – the businessman was doing business this way all his life, and there was no one to ask him due to his influence on the earlier king, and the bribe he was giving him. But, now the time is changed so he had to meet Kautilya aka Chanakya who is the prime minister to resolve the issue. These scenes are filmed in realistic manner and you can see such people situations around you even today also. The behavior and body language are also found almost same. Though, the dialog delivery by the actors playing small roles is not convincing, the scenes are authentic. The conversation between Sudat and Chanakya shows their characters pretty nicely. In few dialogs, you got to know what are the ideologies of the man named Chanakya. The use of words in meaningful pattens, the small and effective dialogs, make this scene a “must to watch” segment of the episode. The frustration of Chandragupta, his consciousness about, despite of being the emperor, he have to follow the guidelines of Chanakya is explored nicely. He now wants to not to be answerable and accountable. But in that case, what will the difference between him and the earlier king? What is the meaning of the entire exercise to reform the society and ruling system? He was called by Chanakya then. The conversation here is really fantastic. With dialogs from the Chanakya’s mouth, the wisdom about the wealth and its various aspects and importance is explored well. He explains what is the price or cost of anything and why it is necessary to pay it, even for the king. You simply got to watch this nice conversation (or rather we say the training session of few minutes, which is worth equivalent to spend years in studying the commerce and business administration). It is followed by the scenes where Chandragupta was informed about the case of Sudat and others like him, by the collector of the state. Chandragupta got furious with this ill treatment to the prestigious people of his kingdom by Chanakya and the authorities working under his guideline. He summons Chanakya for the explanation. Without asking a question or going to the topic he got all his answers through a very small and effective one way conversation by Chanakya! This seems to be one of the best episodes of the TV Serial, without a doubt. K. K. Raina is the theatre actor who got a very few opportunities to show off his skills and it is one such role. He excels in the role of Chanakya. Abhimanyu Singh is convincing as Chandragupta. Rest of the cast members does their job honestly. There is more in the episode to explore. The script and the dialogs are the essence of this episode and they are over the top. The locales are explored really well, mainly through the sets. The wardrobe is authentic. Smaller things are taken care nicely in the costumes, making it effective and authentic. The background music goes with the flow of the episode perfectly. There are several scenes (on stage) where the usage of spot-light mesmerise you. It is one of the episode which you should NOT miss.